I had these grand plans of parading around the upcoming Holiday show dressed as Santa with cute boot cuffs, white gloves, a Santa hat, and maybe even a beard....with Ellie dressed up as an adorable reindeer. I found all my gear through Amazon and feeling a little intoxicated with the ease of ordering plus the two day shipping I also went ahead and ordered some additional Holiday home decor. Then the boxes started showing up.....all of the boxes. And when I opened them yesterday afternoon I was incredibly underwhelmed. The Santa outfit looked cheap in its plastic packaging (but really, what can you expect from a Santa outfit). The reindeer that looked so pretty in the picture was a sad state of glitter disaster. The snowflake window stickies were much, much smaller than I had originally expected. 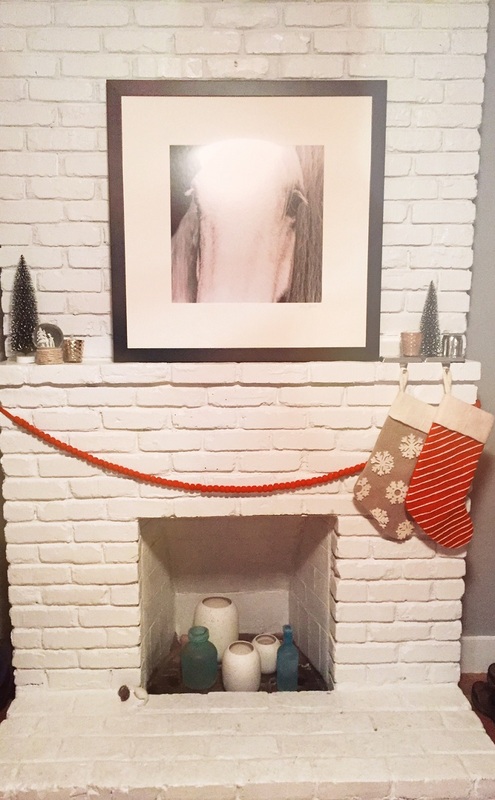 I had been busy telling Paul the other night that our Holiday decor has some equity. It comes out year after year- a few pieces have been coming out for a decade at this point and we have yet to lose a a Christmas or Halloween soldier. I didn't feel like these Amazon purchased decorations would hold up to the test of time. While I don't often return, this morning I packed everything back up into their boxes and got them on their way back to Amazon. 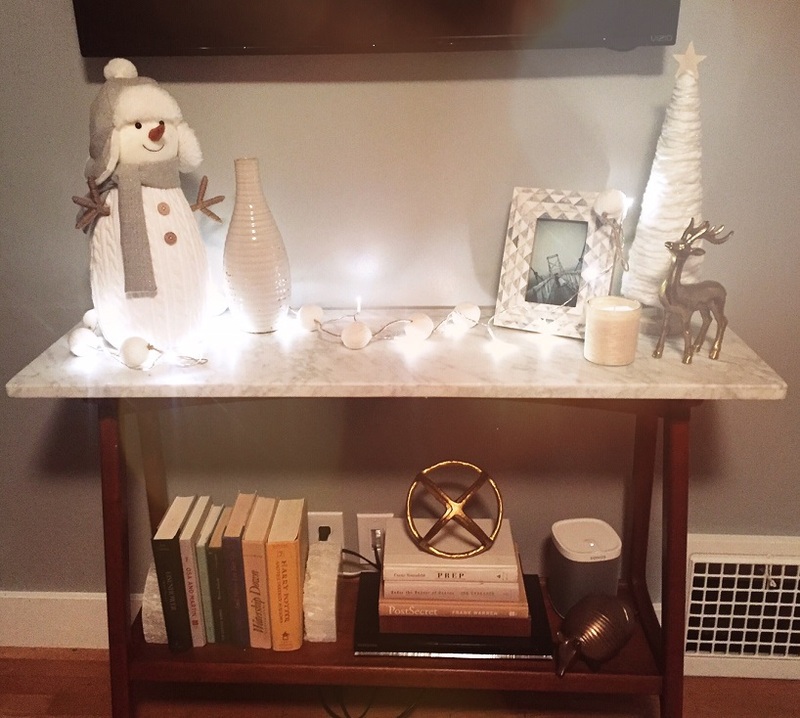 It's not a total loss- a Target stop yielded a friendly new Snowman along with some lights for a pretty console display to add to our festive house! And I think I'll order Ellie a pair of Holiday polos to complete our Christmas show outfit! As well as a lesson learned in the art of Amazon shopping.....don't do it after wine! You can only blame a finger slip on Amazon 1-click so many times. I got a little extra ride in Friday on Miss Lucy- our BO's meter jumper. No jumper jumps, or any jumps, just a whole lot of fun hacking a different beastie! 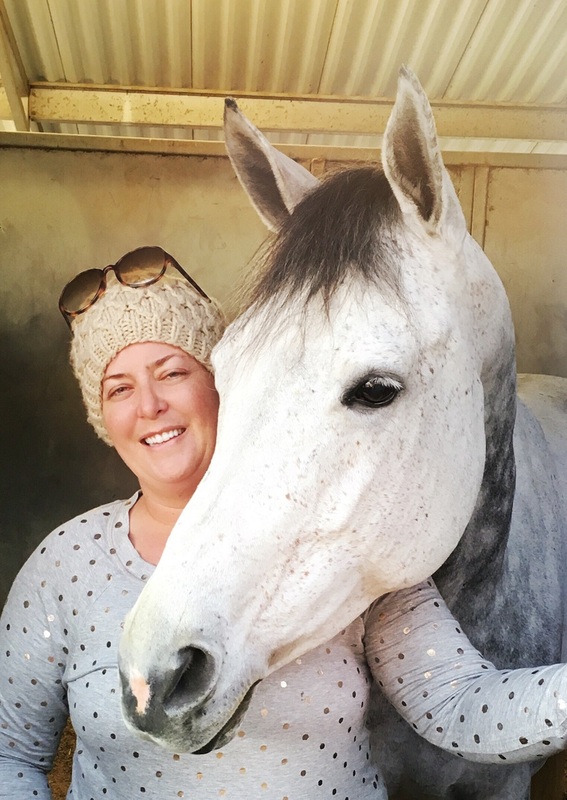 She's got the most comfortable canter! Fingers crossed we can work out a few additional rides to build up that extra riding muscle over the winter! 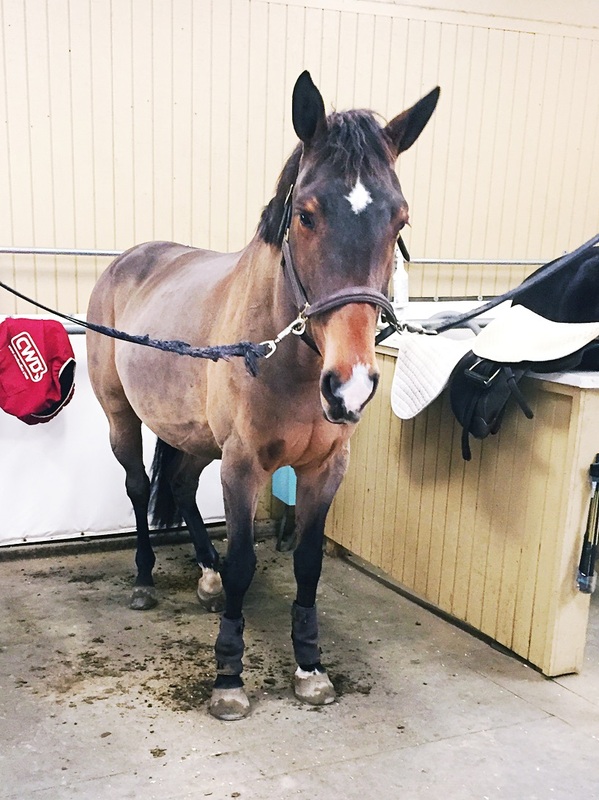 Under saddle- shoot me now. If her swap didn't eliminate us the huge buck she ripped in front of the judge sure did! OF- we went in for one round which was going quite well but she ended up coughing the entire back half of the trip so we scratched the second round. BUT got all my strides! 2nd OF Round- Ali said it was the best course she's seen me ride at a show! If it weren't for a few well placed coughs we might have been in the ribbons! The biggest win of the show were all of the AMAZING photos the show photographer took! Oh yeah! 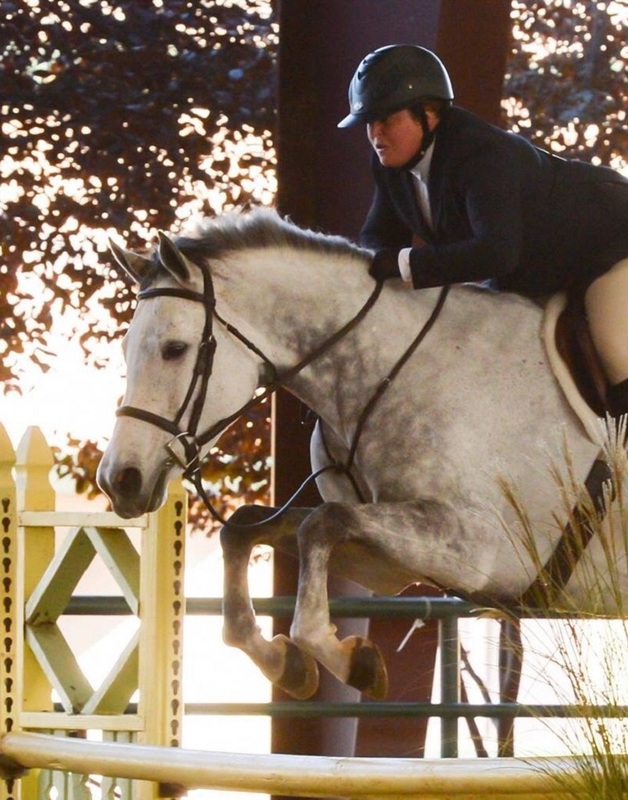 We did the Jumpers at the Autumn Classic! 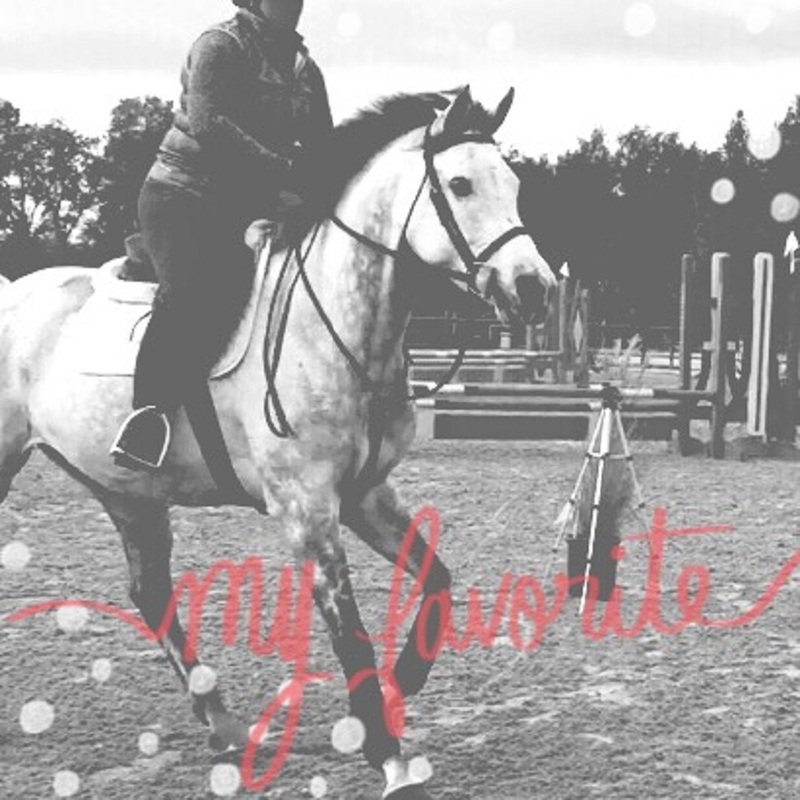 I gave the Jumper ring a go around 5 years ago on my half-leased horse, Ben. He had a pretty short stride and would stop in the combinations when I would lean up his neck. It was the vicious cycle of getting nervous, riding backwards, leaning, and stopping- total confidence building right? Not to mention that for some reason Jumper fences look GINORMOUS without the fill of a Hunter fence. Oh, and trying to remember the courses? Forget it! 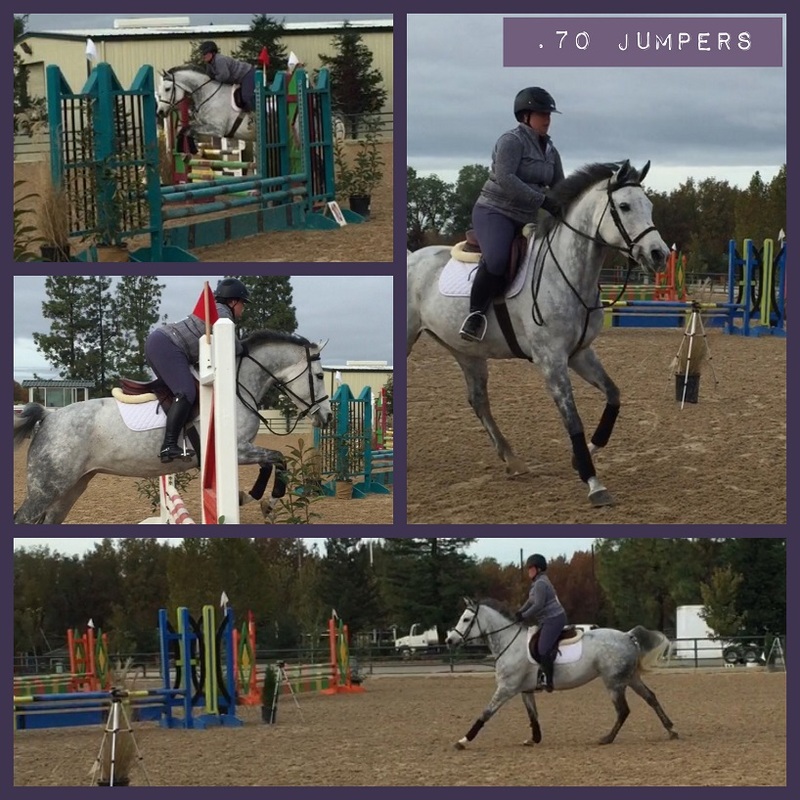 Ellie had a lingering cough so we thought throwing a few jumper classes into the mix might help us get galloping and get some coughs out before her Hunter rounds. Walking into the ring on Friday morning I was a total bundle of nerves. We trotted half of our fences, did a two in the one stride, BUT made it all the way around and had a blast! Saturday we CANTERED all of our fences....with 22 time faults. I didn't even realize that was possible! And on Sunday we really went for it and had a great round with only 7 time faults! Fun bits of progress and I was actually disappointed that we did not get to move into the speed phase! Sunday course! I took advantage of the ring and height and pulled out some purple breeches! I had the opportunity to host a few coworkers at the barn for a team building off-site. The official purpose of the day was to review our Myers Briggs test results but we made some time for a demo by Ali and some rides for the ladies! LK rode a little when she was pretty young but LS had the classic "my first time on a horse I was bucked off" experiences. I admired their courage in jumping up and taking a whirl- particularly on this cold, blustery day. The Ells enjoyed some MAJOR snuggles and treats and was a total ham for the camera. 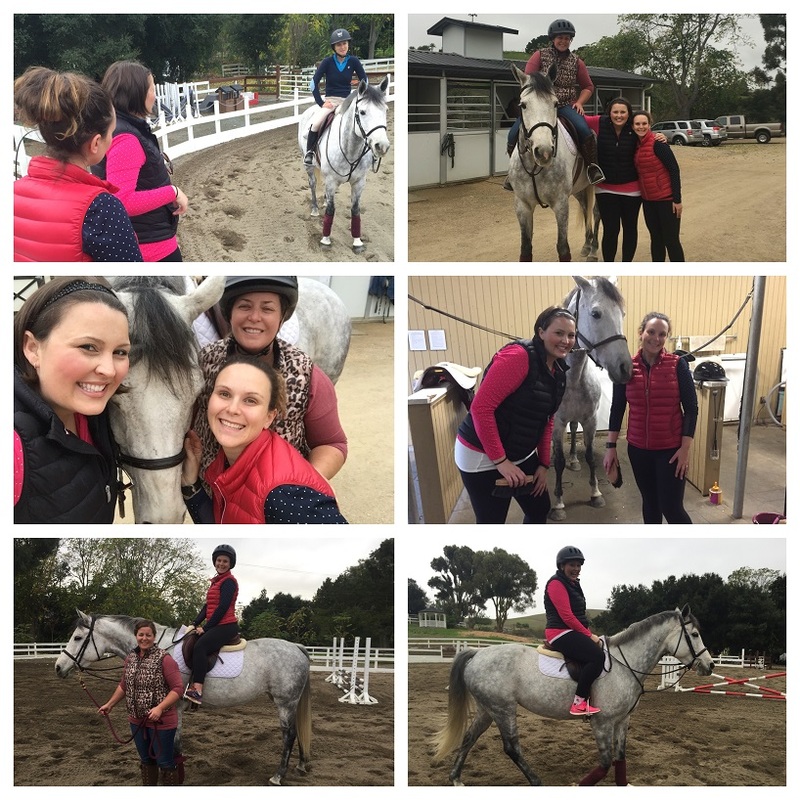 It was really an amazing experience to share horses with non-horsey friends! 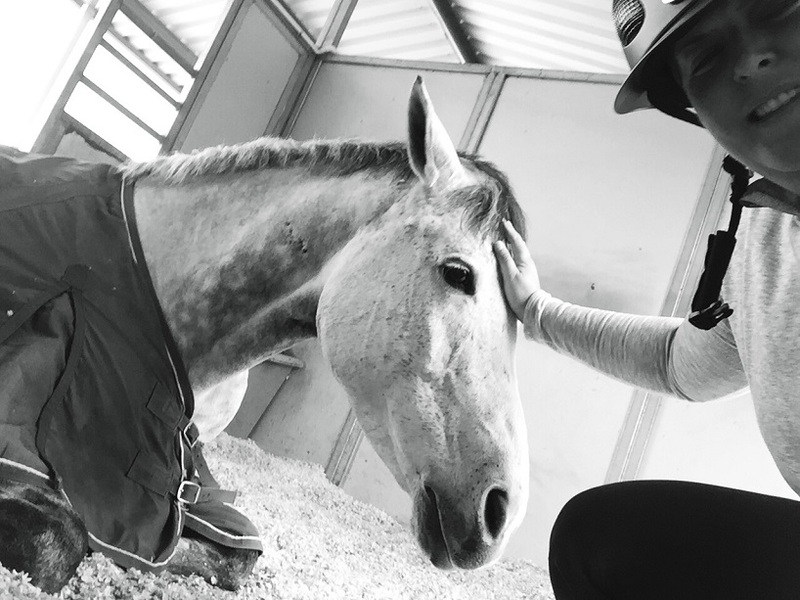 Ellie took a mid-morning nap and had zero desire to get up for our Saturday lesson! The only thing that got her going was the crinkle of a peppermint wrapper! We should all feel bad for her- she works so, so hard! Any opportunity to ditch the show coat...I'm in. 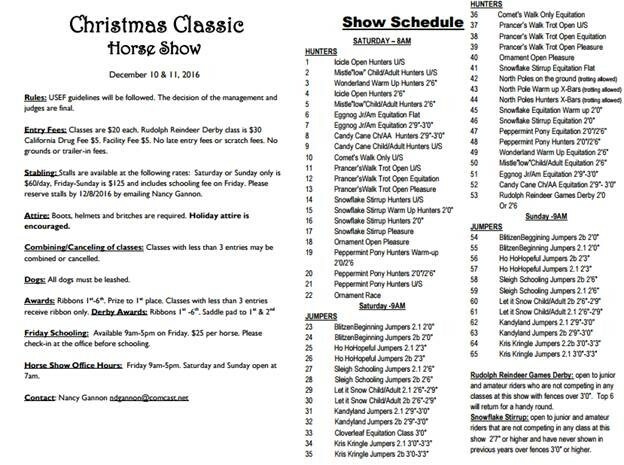 This schooling show calls for breeches and boots......Holiday attire welcomed. 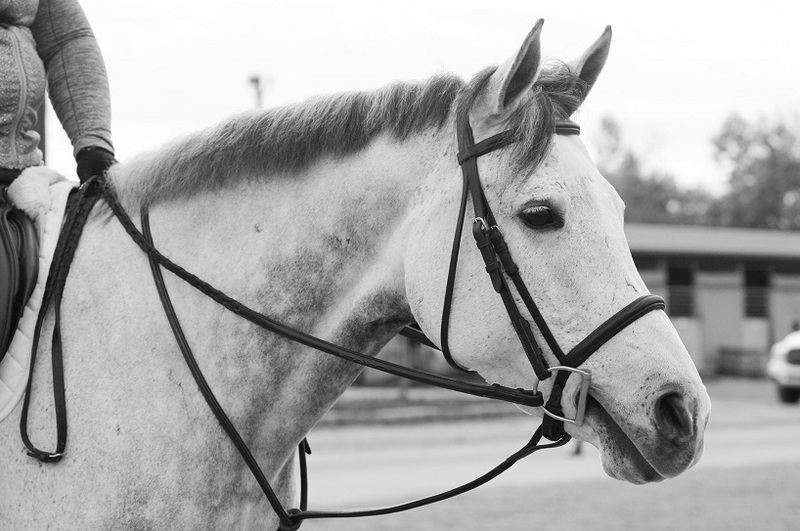 Sleigh Schooling Jumpers: a jingle bell breast collar? Mistle"low" Hunters: a Rudolph and Santa theme (antlers and pink nose for Ellie, Boot cuffs and Santa hat (maybe beard) for Emily)? And the Rudolph Reindeer Games Derby with an "Ugly Sweater"
I'm tempted to take this theme super seriously because it seems like a ton of fun! Please share if you have any fabulous Christmas themed ideas!